This chapter discusses referendum practice in the Netherlands – a consensus democracy with no constitutional basis for referendums. Recurring attempts have been made to amend the constitution to allow for binding referendums, but they all failed. In 2015, a law was implemented allowing for advisory citizen-initiated referendums, but already within three years, in July 2018, parliament has decided to abolish it. This chapter analyzes the 2015 referendum law, as well as the two referendums that took place between 1950 and 2017. It shows that especially the high number of veto players in the process of revising the constitution explains why even today the constitution does not provide for the use of referendums. 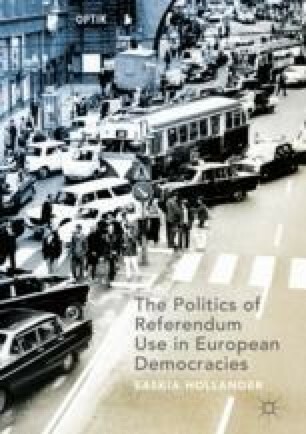 Bearing in mind recent events, the chapter also provides a cautious forecast about the role referendums may play in the future. Harmsen, R. 2003. Europe and the Dutch Parliamentary Election of January 2003. RIIA/OERN Election Briefing 9, April. www.sussex.ac.uk/sei/documents/epern-election-briefing-no-9.pdf. Accessed 10 July 2015. Van der Krieken, K. 2015. Het Lokale Referendum in Nederland: Een Verkenning van de Lokale Referendumpraktijk in Nederland en Scenario’s voor de Toekomst. https://pure.uvt.nl/portal/en/publications/het-lokale-referendum-in-nederland(55b5332e-4225-49d7-b6ce-19c8b4fdb6c9).html. Accessed 20 Dec 2015.